After more than 17 years of operation, the joint ESA/NASA mission Ulysses will officially conclude in July this year. The remarkable achievements of this mission were recalled at a press conference held at ESA Headquarters in Paris on 12 June. In the course of its 17.5 year mission Ulysses has characterised the uncharted high latitude regions of the heliosphere within 5 AU of the Sun over a wide range of solar activity conditions. Its unique trajectory has taken it into the previously unexplored third dimension of the heliosphere, surveying the environment above and below the poles of the Sun, and giving it an important role in multi-spacecraft studies of transient solar wind features. Ulysses has been returning science data for more than a complete solar cycle. This has enabled scientists to study how the physics of the heliosphere changes as the cycle varies from solar maximum to solar minimum and back again. The combination of the complementary suite of instruments, the unusual trajectory around the Sun, and the long duration of the mission have resulted in a body of results which have provided the best-ever understanding of the heliosphere and the role played by the magnetic field in the phenomena occuring inside it, along with a number of other results of broad astrophysical interest. Ulysses has shown that the heliospheric magnetic field is more complicated than had been thought: its field lines follow a chaotic pattern rather than a more regular Archimedean spiral and are also more spread out in latitude than was expected. The behaviour of the Sun's magnetic dipole was by contrast found to be more simple than expected: it simply rotates through 180° from sunspot minimum through sunspot maximum and back to sunspot minimum again in order to achieve the polarity reversal that has been observed. Ulysses observed the solar wind in 4-dimensions and demonstrated the bimodal nature of the wind: it discovered that a steady fast wind (~750 km/s) is present throughout most of the solar cycle and only vanishes at solar maximum when the polar coronal holes disappear. The slow wind (~350 km/s) emerges from the Sun's equatorial zone. The transition from fast to slow is relatively abrupt. Prior to Ulysses energetic particles had been studied in great detail near the equator, but not at higher latitudes. Ulysses has shown that such particles are present at all phases of the solar cycle. They can be found at all latitudes at solar maximum and are shown to be confined to the inner heliosphere in 'reservoirs' from which they slowly escape. During solar minimum energetic particles can reach into the polar caps - contrary to what was expected. The distribution of galactic cosmic rays was shown by Ulysses to be essentially spherically symmetric with the flux being the same at the equator and in the polar regions. Ulysses measured the abundances of many radioactive cosmic-ray isotopes, and showed that these cosmic rays spend much of their lifetime (typically ~20 million years) in the galactic halo before reaching us. Ulysses directly measured the properties of interstellar gas (neutral helium) for the first time. It also showed that the interstellar wind is fast enough to create a bow shock upstream of the heliosphere. Dust particles of interstellar origin were detected by Ulysses proving that they can enter the heliosphere. Large dust grains, with an average mass 30 times greater than expected, were also detected. These contribute ~2% to the total mass of the interstellar medium. Measurements by Ulysses of interstellar helium isotope abundances at the current epoch are consistent with Big Bang theory of light element formation and with a matter density supporting an 'open' Universe. Getting to a solar polar orbit would require an enormous amount of energy. 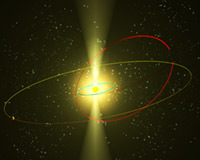 In its orbit the spacecraft would be exposed to extreme environments as it traveled along its trajectory (from perihelion at 1.3 AU to aphelion at 5.4 AU). The large eccentric orbit also imposed constraints on communications - a large (1.65m diameter) high-gain antenna would be required as would a high degree of spacecraft autonomy. Power considerations were also an important issue since the trajectory would take Ulysses far from the Sun. A Radioisotope Thermoelectric Generator (RTG) was chosen to provide power rather than solar arrays. The thermal design of the spacecraft had to be able to withstand large temperature variations of its orbit. Electronic components had to be radiation hardened to endure the harsh conditions near Jupiter. During its operational phase Ulysses continued to provide challenges. Soon after launch the spacecraft started to wobble (nutate). The cause of this nutation was identified as due to the flexing of the 7.5 m axial boom as it was heated by the Sun. This could have been disastrous for the scientific return of the mission: Ulysses required a pointing accuracy of 0.5° but was wobbling by a few degrees. The problem was solved by using the spacecraft thrusters in an unconventional way to correct the anomalous wobble. Once the mission had been extended inevitable difficulties arose in ensuring power to all payload and essential spacecraft systems. The amount of power generated by the RTG naturally diminishes over time. As the mission progressed beyond its original five-year operational phase new strategies had to be devised to cope with the reduction in power. (The RTG power output decreased from 285 Watts in 1990 to 195 Watts in 2008.) Judicious sharing of the available power ensured that Ulysses continued to provide excellent data for well beyond its original planned operational lifetime. At the beginning of 2008 it became clear that the end was in sight as the failure of a main transmitter power supply left a critical cold spot near a fuel line. Once the fuel freezes, the spacecraft can no longer be controlled. At this point, sometime in the next month or two, the mission will officially come to an end. 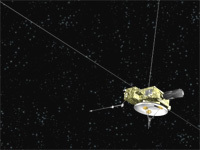 The unique set of data which has been accumulated by Ulysses is publicly accessable via two channels: the ESA Ulysses Data Archive (hosted at ESTEC), and the NASA National Space Science Data Center (NSSDC). There is no formal proprietary period for Ulysses data - it is placed in the public archive once it has been verified by the PI teams. The Ulysses data archive will continue to be a rich resource for scientists keen to probe the physics of the heliosphere long after the spacecraft ceases operations.